We noticed one time while cutting out some arms for our Clarks Original Adirondack Chairs that the shape of the remaining scrap wood resembled a Cardinal bird. With a little dose of imagination and a few extra cuts, as well as some creative painting we came up with our wooden Cardinal birds. 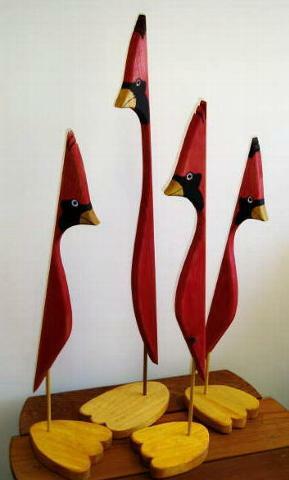 Made with Cypress or Yellow Poplar wood each bird is different and unique. Birds are about 30" inches tall.